PARENTS — please teach your children well. Teach them the difference between right and wrong. Teach them to respect others. And above all else, teach them how to make nifty napkin folds! The fleur de lis (pronounced, more or less, “fluhr duh LEES”) is a graceful fold. It’s suitable for any dining occasion. 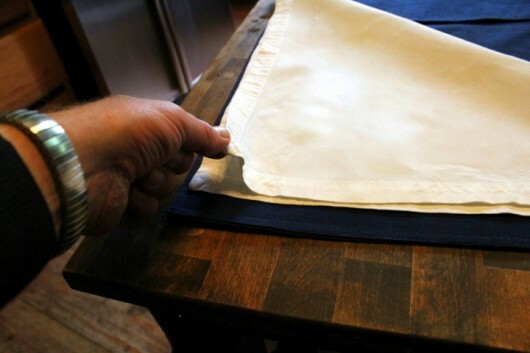 To start, ask Alice the scullery maid or Bruce the handyman to starch and iron your napkins. 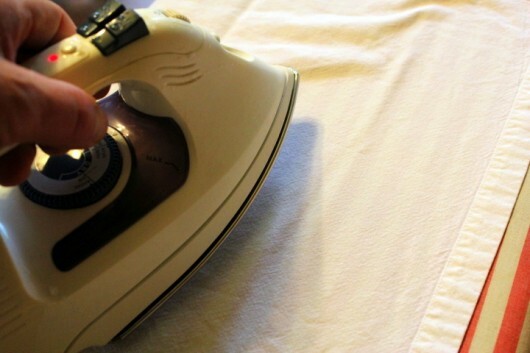 If Bruce doesn’t know how to starch and iron, then he isn’t much of a handyman, is he? Perhaps he has other attributes. 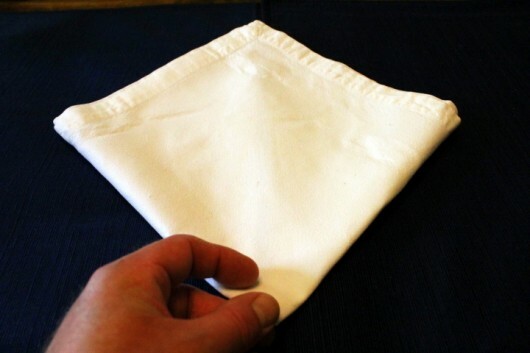 In any event, a too-soft napkin won’t hold a fold. 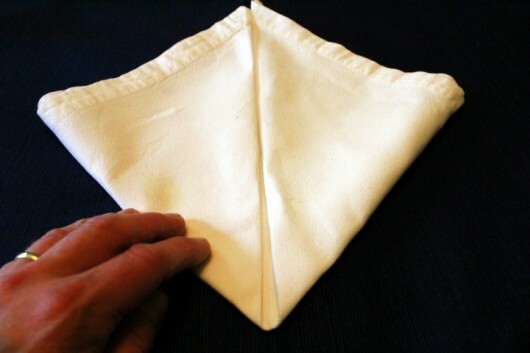 Fold the napkin diagonally in half, to form a a big triangle. And drag it up to the top point of the triangle. Do the same with the left corner. Your triangle is now a diamond. 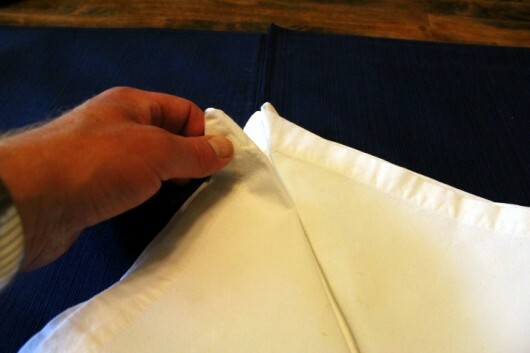 And fold the bottom section approximately two-thirds up, as shown. 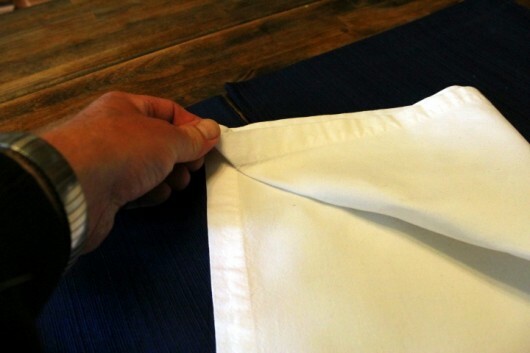 Using your fingers, press down on the bottom edge of the fold. 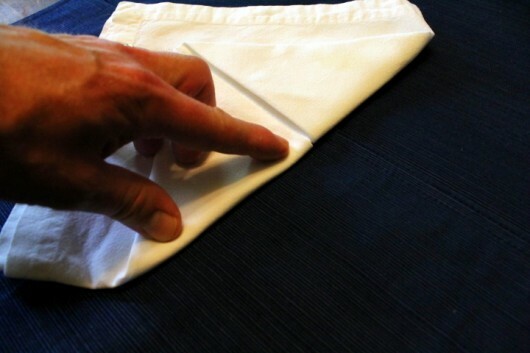 Next, fold the little triangle down so its point lands flush with the bottom of the napkin. Press down firmly on the fold. Roll the right and left ends toward the center, and tuck one side into the other. 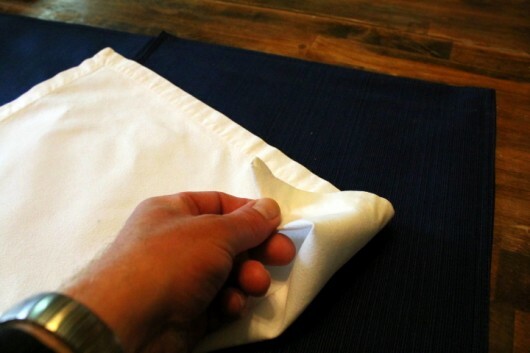 Stand the napkin up, and then pull down on its sides to create the petals of a lily. Now center your work on a dinner plate, surround it with the appropriate silverware and a goblet of wine, and you’ll have a table setting that invites romance. Who wants to dine out? Folks, I have lots of nifty napkin-folding tricks up my sleeve. If you’d like to see them, then by all means say so in the comments field below. As always, I love to hear from you. And for other random acts of domesticity, be sure to sign up for my weekly email newsletter. Thank you so much for the 101 on napkin folding! Now I know why mine didn’t work,,needed starch! And YES, PLEASE show more! I am a new reader here and have not only loved what you have written but I have been so inspired by what you have written! Please don’t ever stop, for if you do,,then all hope for me to achieve my gardens are lost. Thanks again, you most adoring newest fan! 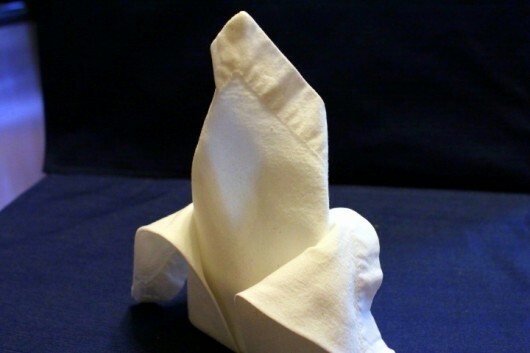 I’m always looking for interesting new napkin folds…. Love to see some more. By the way, it’s a little difficult to make out, but is your silver pattern Charter Oak? If so… It’s a great pattern. I’ve collected it for years and add pieces here and there whenever I find them. Just lovely. So well done. Thank you for showing us. 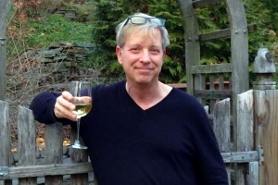 Hi Terry – Nice to meet you! Hi Scott – Silver pattern is Reed & Barton ‘French Renaissance.’ Charter Oak from Rogers is stunning, too — is that what you have? CarolAnn – Thanks for looking. More nifty napkin folds to come! 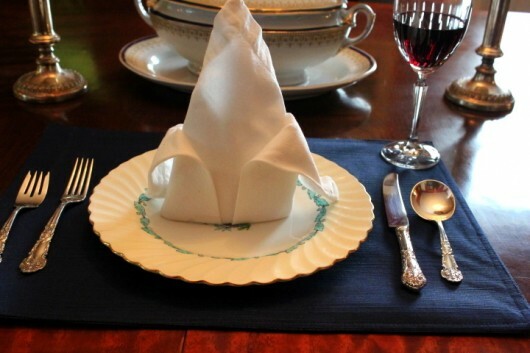 Thanks, for these pictures, I love dressing up a table, and when younger, my oldest son liked Origami and so decided he was in charge of napkin folding….you can imagine some of the um…shapes..folds….and experiments. But he had fun doing it and mastered several of the basics which I use often. Can’t wait to see more. Lovely table setting by the way! So enjoy your postings!! Would love to see more on napkin folding! yes, please do share such! I know nothing about napkin folding. I printed this one out and look forward to more such posts. Kevin, please add more origami napkin folding to your blog. I am not a new to your blog but, being a diabetic, there are many delightful and delicious (I trust) postings that I must choose not to create. Still, I enjoy every blog post for the beauty, the HUMOUR, and yes, for those wonderful tips and recipes that I AM able to bring into my life. Thank you from one of your Canadian fans ! 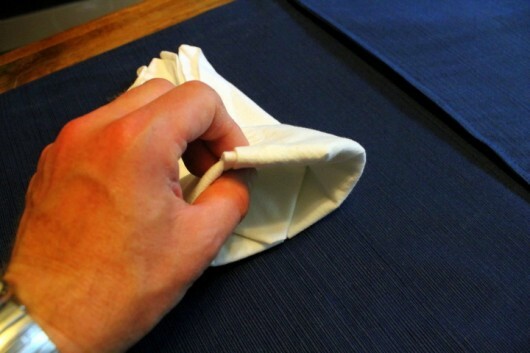 I’ve always wondered how to fold napkins in fancy ways but never took the time to figure it out. Thanks! I’ve love to see other styles. You sure set a beautiful table Kevin and that napkin looks perfect….you make it easy to follow too….enjoy this beautiful day in your garden with a wonderful cosmo!!!! Hi Kevin, loved the post today. Just in time for my roses, loved the addition of napkin folding – please do more, and the Limoncello Cookies. 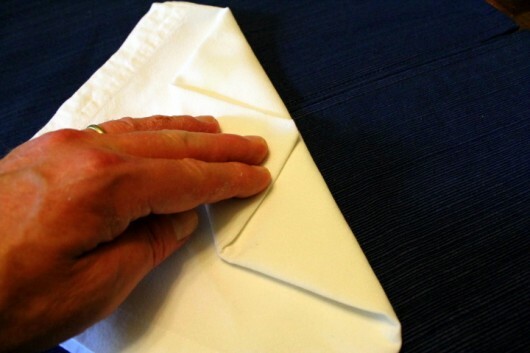 I taught my grandsons how to do the one fold I know and my daughter was horrified that her sons were folding napkins. They thought it fun, though, so I plan to keep teaching them about the finer things in life. Keep up the good work! 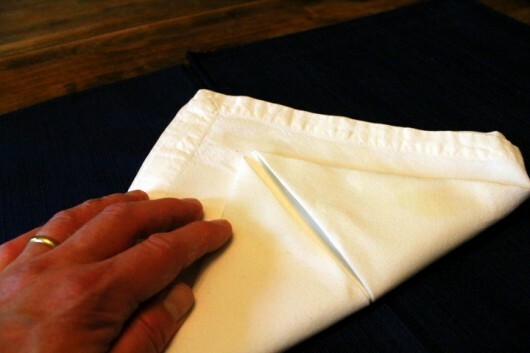 Please do share more napkin folding tips and tricks! Long ago I learned to create a lotus with a napkin, and that has been my fall-back pattern when dressing up my table – but it only looks nice with my white or pink napkins.. Your step by step instructions with photos are great and I’d live it you’d share more. Yay! I did it! Thanks for the lesson. Valerie C. – Congratulations — you’ve mastered the fleur de lis! I would love to see more napkin flooding ideas. Your recipes are wonderful! More napkin folds! I have grandchildren to teach! It’s like origami, a personal favorite! Yes, by all means, do more napkin folds. What a lovely table setting. 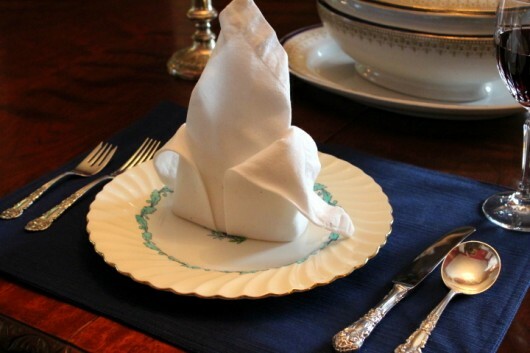 I would love to see more napkin folding techniques. It is a dying art, and I’d love to help revive it. I love your website and your emails and folded napkins!!!! Please make a series of these. More napkin-folding, please. 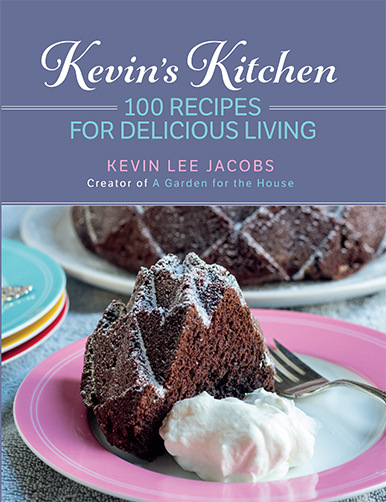 Your fabulous recipes deserve to be presented with a flourish. Love the napkin folding, for sure want more. so cool! i can’t wait to show my 7 yr old daughter this! and YES, more please!